Yes, you read that right: we’re getting a new stove! The old one had an extra-hot (15,000 BTU) burner and a simmer burner, along with two regular burners. (I don’t need to explain that this is a gas stove, do I?) The oven left a lot to be desired. It now runs at least 25 degrees below what it’s telling me (that little liar! ), and it simply refuses to brown anything at all. I actually use my creme brulée torch to brown foods. The stove was wonderful 15 years ago, when we first got it. Now we have to light each burner with a match. The pale grey enamel on the grates is stained beyond salvation — the parts that haven’t chipped off, that is. Did I mention that the new stove has much more sensible cast-iron grates? The new stove has a super hot burner (17,000 BTU–yes, that’s right, 2,000 more BTUs), a simmer burner, two regular burners, and — wait for it — a center oval grill burner. Tom can’t wait for that extra burner. It comes with a griddle, a grill, and a plain grille. I’m hoping for an improvement in the oven. I may have to backtrack and change all my oven times and temps in the previously posted recipes. This may well be my last post using the sad old stove. This recipe came about as so many of my dishes do, by using up what was in the house. 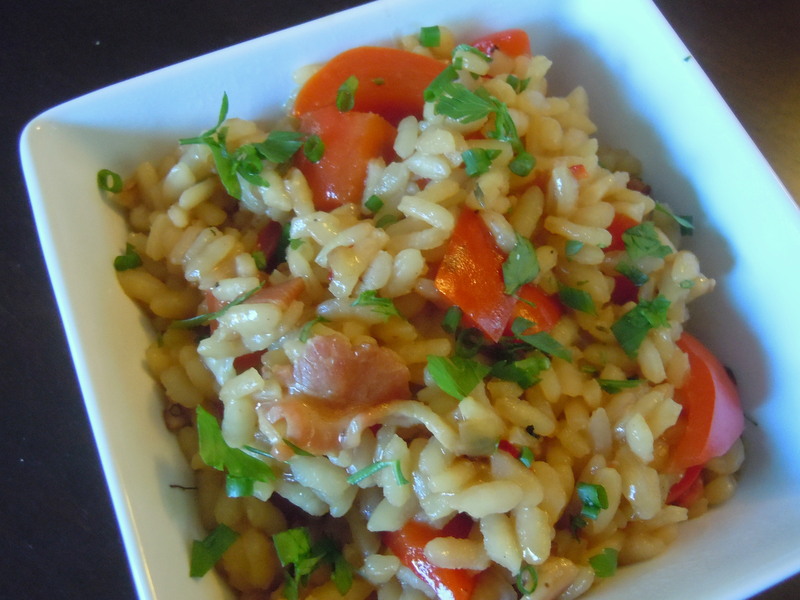 A few days ago, I made a huge batch of red pepper-pancetta risotto. It seems like Luke has soccer every night these days, and Tom and I had meetings, so I needed a go-to dish we could reheat. This is your chance to throw my own words back at me, so go ahead: “Diners wait for risotto; risotto does not wait for diners.” But let’s take a moment to remember the bliss that is the risotto cake, and how terrific risotto is as a stuffing. We had some lovely zucchini in the fridge, and a giant bowl of the aforementioned risotto. I learned how to stuff and bake eggplant back when I lived in Boston; why not use the same technique for zucchini? I halved and scooped out the zucchini, and popped the halves into the oven to soften. Meanwhile, I sautéed the extra zucchini bits to add to the rice. A handful of cubed cheese helped to bind the filling. 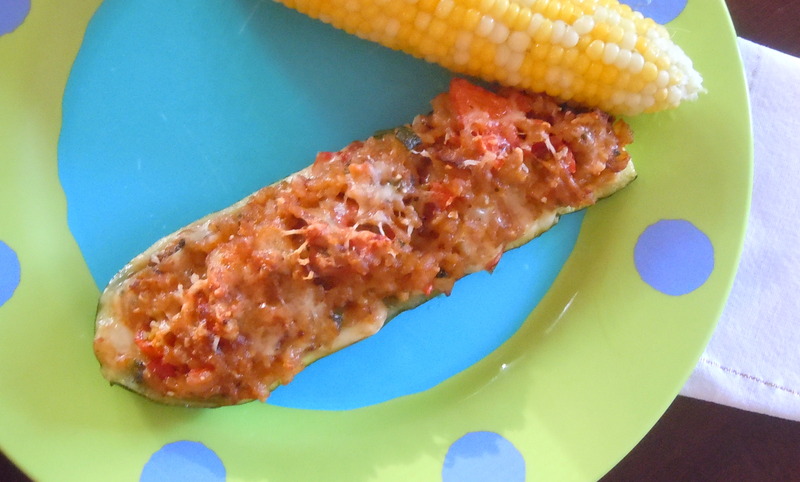 When the zucchini boats were mostly tender, I stuffed them, sprinkled them with some parm and popped them back in the oven for another 20 minutes. The zucchini boats hold their shape but become sweet and impossibly tender. The rice develops a crunchy golden crust (even in my old oven!) but is soft inside, held together with that gooey cheese. With a minimum of alterations, this makes a fabulous vegetarian entrée or side dish. We made a super-simple pantry version of this last week: the stuffing was composed of cooked orzo, jarred pizza sauce, diced pepperoni, and mozzarella. Fast and easy, and a really delicious way to get reluctant eaters to chow down on the veg. Heat the oven to 375 degrees F. Spread 1 tbs. of the olive oil in the bottom of a baking dish just large enough to hold all 4 zucchini halves. Cut the stems off of the zucchini and discard. Cut the zucchini in half lengthwise. 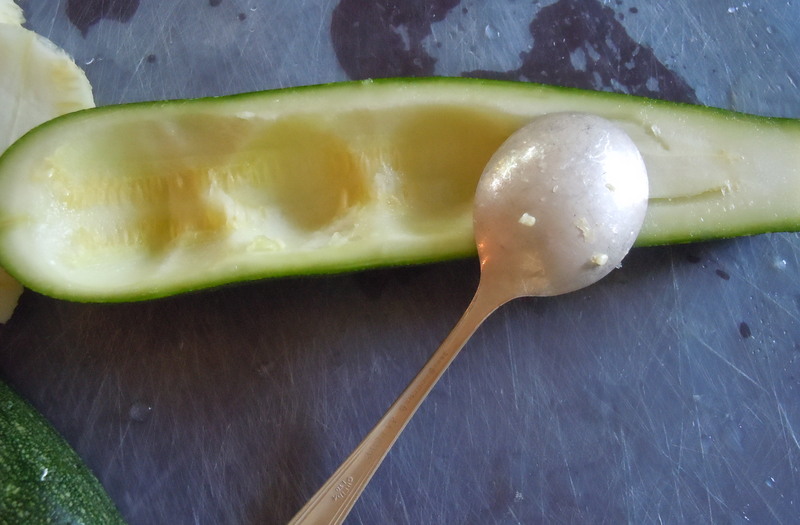 Using a spoon or a paring knife, scoop out the insides of the zucchini, creating a boat about 1/4-inch thick. Save and chop the inside pieces you scooped out. Lay the zucchini boats cut sides down in the prepared baking dish. Cover with foil and bake for 15 minutes, until they are tender but not cooked through completely. Meanwhile, saute the chopped bits of zucchini insides along with the jalapeño (if using) in the last tbs. olive oil until tender. Stir in the tomatoes, risotto and the cheese until evenly combined. *Risotto: any flavor will work, as long as it doesn’t contain large chunks of veg or meat. For the red pepper-pancetta risotto, I sautéed 3 oz. chopped pancetta with 1 minced onion and 1 clove minced garlic until the veg were tender and the pancetta was nicely browned. I then proceeded with the standard risotto recipe. While the risotto cooked, I chopped up a large red bell pepper and sautéed it in a bit of olive oil until tender, then stirred it into the risotto. Add 1/2 tsp. hot red pepper flakes or Aleppo pepper for some heat, if that suits you. This entry was posted in main courses, pasta, rice, and grains, sides, veggies and tagged cheese, orzo, parmesan, pasta, pepperoni, pizza sauce, squash, zucchini. Bookmark the permalink.